Happy Chinese New Year! It’s now the year of the Tiger and we hope you are getting ready to pounce into the year with good vibes and prosperity. This Sunday is also Valentines Day! Double Happiness! We hope you aren’t running down the street being chased by a cupid with sharp arrows instead we hope it’s filled with heart shaped candy, lots of love and maybe even some flowers. This week the Chicago Foundation for Women announced the awardees of this year’s IMPACT Award and among them was Veronica Arreola. Felicidades! Proyecto Latina kicks off Monday, Feb. 15th with Ruth On The Rocks @ Cedahlias Cafe @ 7pm so bring something to share and some chisme for the chisme box! Pros Arts Studio Mobil Lab at Dvorak Park offers a free computer lab for people looking for jobs online or want to improve their computer skills. 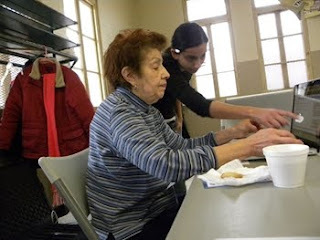 Extra Newspaper Columnist Rebecca Sanchez reports that in the Little Village neighborhood food distribution from 2008-09 has increased by 95%. North Carolina school secretary loses her job for translating to Spanish-speaking parents. America Ferrera talks to Bust Magazine about Hollywood racism. Community Partners – Mil Gracias! Proyecto Latina wants to take a moment to thank some amazing community partners that have supported us along the way. 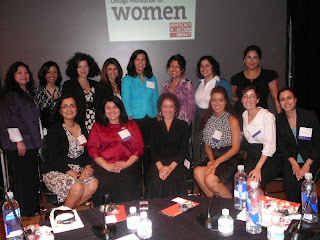 Our newest community partner includes the Chicago Foundation for Women’s Latina Leadership Council. All of these organizations are impacting our communities. We encourage you to go to their websites and support the wonderful work they do year round. Diana Pando: What is the Latina Leadership Council and how is it impacting Latina women and girls in Chicago? Lilliana De Santiago: The LLC is a network of women committed to improving the lives of Latina women and girls in the Chicago area. Each woman who joins the council is a volunteer and comes from a variety of professional backgrounds. Our work within the LLC is to raise awareness of the issues impacting the Latina community and find the resources to support those organizations that are doing great work to address them. Our main goal is to raise funds by encouraging our peers, family and colleagues to participate actively in philanthropy. Diana Pando: How did both you and Silvia get interested in philanthropy? Lilliana De Santiago: I became interested in philanthropy through my desire to have a much more global and at substantial impact on the communities and causes that I am passionate about. I volunteer as often as I can, but that can often be limited by life. I find that by giving and educating others about causes and encouraging them to give is incredibly fulfilling and I am often able to do much more with those dollars than I can at times with my own hands. Silvia Rivera: My parents were ones who never hesitated in giving, if it wasn’t financially, it was by offering their home, food, or helping hand. I think that the example they set for me, is one that most Latinos live by. We are philanthropists by culture. As a young adult these cultural values were strengthened through my involvement with the National Museum of Mexican Art. Working for a Latino-led cultural institution inculcated in me the importance of supporting and strengthening the cornerstones of our community. 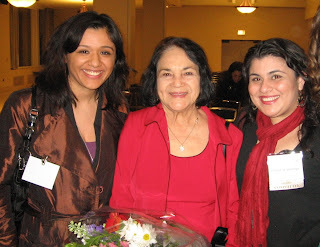 Diana Pando: How has being on the Latina Leadership Council impacted both you? Lilliana De Santiago: Being on the LLC has helped me to connect with a strong network of passionate Latina women and also has given me confidence in my own personal strength. It is a truly a blessing to be among women who have so much life and passion. These women make things happen in their lives, but are humble and caring and will go out of their way to help their community. It has been a very positive experience. Silvia Rivera: I have made it a life’s mission to connect with those women that inspire me and to inspire others. There is an indescribable sense of pride that I feel whenever I am surrounded by the women of the Latina Leadership Council. These are women that have triumphed over a variety of life’s challenges, and are a constant reminder that wise Latinas are all around us. Diana Pando: How is the money you raise at your benefit be used? Who are past recipients? Lilliana De Santiago: The LLC takes the funds that it raises and conducts yearly grant making efforts to support community organizations. Our past grantees have included: Mujeres Latina en Accion,Pilsen Alliance,Centro Romero,Centro San Bonifacio,Teatro Luna. Diana Pando: What have you learned about yourself and others from being on the council? Lilliana De Santiago: There are many things that I have learned as a member of the council and my involvement with the foundation. My sense of commitment to a cause has grown as well as my sense of social reasonability. I truly feel that I am making a difference working with and committing myself to the LLC. Silvia Rivera: Being on the council has strengthened my belief that Latina’s should be the driver’s of this generations political, cultural, and social agendas. There is no doubt in my mind that Latina’s have the talent and the know-how needed to change our society for the better. Diana Pando: Who are the other women on the council? Diana Pando: What trends are you seeing with Latinas in Philanthropy in the middle of this economic downturn? Lilliana De Santiago: The trends that I see are working collaboratively with the arts and/or leadership events. The arts are an amazing venue where culture, opinions, passions, and current events are voiced in a multitude of ways that can relate to the masses. The LLC has partnered with the arts for their annual fundraiser for the last 3 years and they have proven to be highly successful. The goals with our events are to expose people the many elements of the Latino cultures, entertain them and educate them to the issues of Latina women. We have been fortunate enough to accomplish that and be recognized as an organization that does that on a yearly basis. We hope to continue that trend. Silvia Rivera: Now, more than ever, we have to be united in supplementing the losses community organizations have experienced due to the economic downturn. Cut backs have negatively affected Latina agencies, many of which are being forced to decrease the services they provide. The good news is that our ability to partner with arts organizations, has proven to be a wonderful formula in reaching out to a diverse cadre of financial contributors. It is true that when times are tough, the comadres come through. Diana Pando: What plans do you and Silvia, the new co-chair, have for the Latina Leadership Council in the coming months? Lilliana De Santiago: Grow bigger, better, and wiser. We continue to look for amazing women who are willing to make a commitment to service, education, and philanthropy. We also will be working on a fundraising strategic plan to map out our philanthropic goals and events for the next year or two. We have an amazing group of women with a million great ideas and we nee to harness those ideas and see how we can make them realities. Silvia Rivera: I hope that we increase the visibility of the Latina Leadership Council amongst organizations that might benefit from our fundraising efforts. Likewise, I hope that we can continue on our upward fundraising momentum. Chicago Foundation for Women’s Latina Leadership Council is proud to announce a special one-night benefit performance of The House on Mango Street at the Steppenwolf Theatre. This is generously cosponsored by Steppenwolf Theatre. Profits from the event will go toward the Council’s Maria Mangual Unidas Fund, which awards grants to nonprofit programs in the Chicago area working with the Latina community. Join us for a pre-show reception with wine and hors d’oeuvres, where you can meet council members and learn how you can get involved. Based on the novel by celebrated Chicago writer Sandra Cisneros and adapted by Tanya Saracho, The House on Mango Street is the touching and humorous story of a young girl growing up in one of Chicago’s culturally diverse neighborhoods. Esperanza Cordero dreams of a new life far away from her tiny home on rundown Mango Street in this classic coming-of-age story about those defining experiences that shape our beliefs and help us discover who we are.